Growing violets is easy and FUN! Free alerts for stores in your zip-code, get them right on arrival! We ship all year where weather permits! In terms of temperature, humidity and other factors of air quality, African Violets thrive in an environment that most people would consider pleasant. If you feel comfortable, chances are, your African Violets are comfortable as well. However, if your African Violets are exposed to extreme temperatures, even for a very short period of time, they may suffer. Try to provide your African Violets with at least 50 - 60% humidity. Move it immediately to a place where the temperature is warm. Remove any tissue that has become dark and mushy. This will prevent the spread of rot. Discontinue watering and fertilizing, but maintain high humidity by employing the bag method. Place your African Violet in a clear plastic bag and close the top with a wire twist. Keep the Violet bagged for about one week. At that point, it should be safe to return your African Violet to a normal watering and fertilizing schedule. If you know that the temperature is too warm, gradually reduce it to about 70 degrees F.
Depending on how long your African Violet has been exposed to excessive heat, you may need to decrease the frequency with which it receives water. 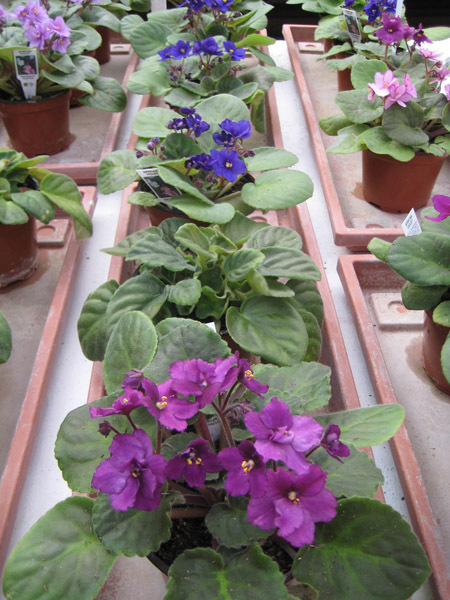 Low Humidity As with relatively warm temperatures, humidity is vital to the health of African Violets. In their native habitat, the relative humidity is generally about 70 - 80%. Use a self-watering device, such as the Watermaid, which relies on capillary matting to draw water into the soil. Place containers of water around the plants. The evaporation increases the water content in the air surrounding your Violets. Consider using a humidifier. This will probably be more necessary during the winter months than during than the summer.